Lemon balm is a citrus-scented, aromatic herb. It is a perennial member of the Lamiaceae (formerly Labiatae), or mint, family and has proven benefit to the nervous system. This lovely Mediterranean native, dedicated to the goddess Diana, is bushy and bright. 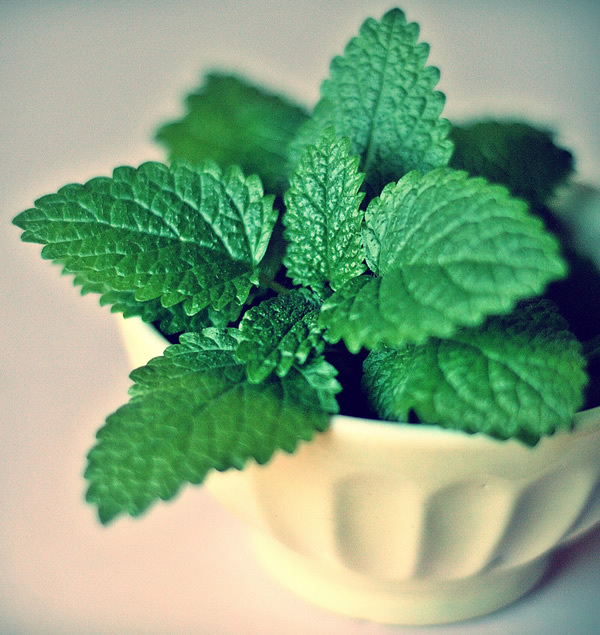 Greeks used lemon balm medicinally over 2,000 years ago. Honey bees swarm to the plant. This attraction inspired the generic name, melissa, the Greek word for honeybee. Romans introduced lemon balm (Melissa officinalis) to Great Britain where it became a favorite cottage garden herb. The plant has been naturalized in North America. Lemon balm grows in bushy clumps to 2 ft (0.6 m) tall and branches to 18 in (45.7 cm). It thrives in full sun or partial shade in moist, fertile soil from the mountains to the sea. The heart-shaped, deeply-veined leaves exude a pleasant lemon scent when brushed against or crushed. They have scalloped edges and square stems. The tiny white or golden blossoms grow in the leaf axils, and bloom from June through October. The plant is hardy, self-seeding, and spreads easily in the right soil conditions. The plant has a short rhizome, producing the erect, downy stems. The essential oil content appears to be highest in the uppermost third of the plant. Lemon balm is a soothing, sedative herb that can relieve tension and lift depression. An infusion of this citrus-scented herb will improve digestion, reduce fever, ease spasms, and enhance relaxation. The plant has antihistaminic properties and helps with allergies. Lemon balm infusions, taken hot, will induce sweating. Lemon balm has been used for centuries to calm the mind, improve memory, and sharpen the wit. A daily infusion of lemon balm is said to promote longevity. It is a helpful herb in cases of hyperthyroid activity, palpitations of the heart, and tension headache. It can relieve pre-menstrual tension and menstrual cramping. It helps promote good digestion, relieve flatulence, and colic, and can ease one into a restful sleep. Lemon balm has antiviral and antibacterial properties. Used externally as a skin wash, this gentle herb can ease the sting of insect bites, soothe cold sore eruptions (herpes simplex), and treat sores and wounds. 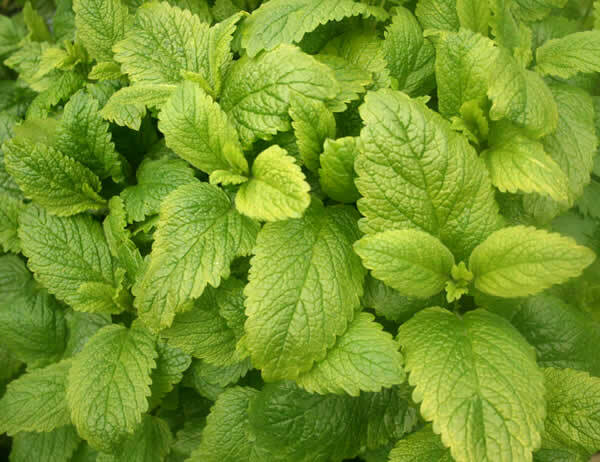 Lemon balm’s highly aromatic qualities make it a good insect repellent. It is also valued in aromatherapy to relax and soothe a troubled mind. Fresh leaves are often added to salads, or used with fish, mushroom, and cheese dishes. In France, the herb is used in making cordials, and is called Tea de France. Apart from its traditional medicinal uses, lemon balm is used to flavor vermouth and other alcoholic beverages as well as some soft drinks. Lemon balm contains volatile oils, including citral, citronella, eugenol, and other components as well as flavonoids, triterpenoids, rosmarinic acid, polyphenols, and tannin. Several new flavonoids were discovered in lemon balm in 2002. Flavonoids are a group of water-soluble plant pigments that have antiviral and antioxidative qualities. Lemon balm leaves and flowers are used in medicinal remedies. The herb is at its best when used fresh from the harvest. The leaves may be picked throughout the summer, but the flavor is at its prime just before flowering. When the plant is dried for storage, the volatile oils diminish, reducing the medicinal potency of the herb. Freezing the fresh harvest is a good way to preserve the leaves for later use. 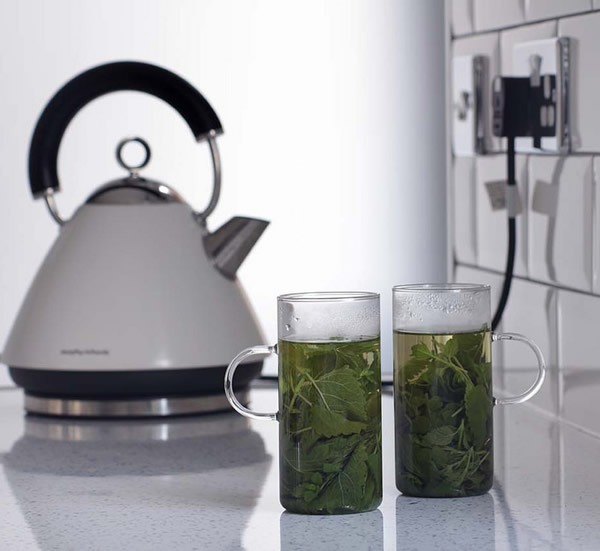 To create a tea, place two ounces of fresh lemon balm leaves in a warmed glass container; bring 2.5 cups of fresh, nonchlorinated water to the boiling point; add it to the herbs; cover; and infuse the tea for about 10 minutes. Once strained, the tea can be consumed warm. The prepared tea will store for about two days in the refrigerator. Lemon balm infusion is a gentle and relaxing tea. It may be enjoyed by the cupful three times a day. Lemon balm combines well with the leaves of peppermint (Mentha piperita), and nettle (Urtica dioica), and the flowers of chamomile (Matricaria chamomilla). Lemon balm has been used safely for thousands of years. However, pregnant women and individuals with hypothyroidism should avoid use unless under consultation with a physician. Use caution when harvesting because of the likely presence of bees. The sedative effect of lemon balm means that it can depress the central nervous system when given in high doses. In addition, it has been reported that persons with glaucoma should avoid using essential oil of lemon balm, as it can raise the pressure inside the eye. Lemon balm should be used in lower dosages when combined with other herbs, particularly such other sedative herbs as valerian. In addition, lemon balm should not be taken together with prescription sedatives or alcohol, as it can intensify their effects. Lemon balm has been reported to interfere with the action of thyroid hormones. Persons taking any medication containing thyroid hormones should not take lemon balm. A physician should be consulted before taking lemon balm in conjunction with any other prescribed pharmaceuticals.